A heavenly father sends a beloved son to save a chosen people: Moses, Jesus, or Superman? The correct answer: All of the above. While comic books were wildly popular during World War II, their influence in American culture waned during the 1950s. The campy Batman television series in 1966 led to animated versions of DC and Marvel heroes and a few live-action 1970s series like Wonder Woman and The Incredible Hulk. In 1978, Superman: The Movie made audiences worldwide “believe a man can fly.” Yet aside from three sequels, that film did not inspire a plethora of superhero films; 11 years elapsed before Tim Burton’s Batman set box-office records. Fast forward to the 21st century, where superheroes have become vital to the motion picture industry. “The summer  box office is the worst the movie industry has seen in more than a decade,” according to Variety reporter Seth Kelley. Yet a trio of superhero films—Wonder Woman, Guardians of the Galaxy Vol. 2, and Spider-Man: Homecoming—prevented a complete disaster by grossing nearly 30 percent of the $3.8 billion in ticket sales. How did superheroes move from the fringes of popular culture to the mainstream? One reason is their malleability in adaptation. Since the 1978 Superman film, numerous incarnations of the character have adopted different genre conventions. The 1990s television series Lois and Clark reframed the characters using romantic comedy tropes; the long-running CW drama Smallville focused on young Clark Kent as a coming-of-age story; most recently, Man of Steel (2013) introduced Superman to the DC Extended Universe films using “first contact,” science-fiction conventions. Marvel Studios’ Cinematic Universe—17 films with 3 more releases in 2018—has similarly appropriated different genre conventions to keep storytelling fresh. Captain America: The Winter Soldier placed Steve Rogers in a conspiracy thriller. Though Guardians of the Galaxy was a little-known property, Marvel gambled that a well-executed, science-fiction adventure comedy would appeal to mass audiences. Similarly, Ant-Man, one of Marvel’s smallest heroes (literally), functioned as a heist film. Contrast this with Thor: Ragnarok, in which Thor Odinson and Hulk battle each other in an alien arena. Technology allows Chris Hemsworth and a computer-generated version of Mark Ruffalo to engage in a no-holds-barred, gladiatorial battle. Though some comic-book purists bristled that Marvel Studios placed these characters in a buddy comedy, the film has grossed nearly $800 million worldwide thanks to director Taika Waititi’s balance of humor, action, and pathos. The Judeo-Christian creators of classic DC and Marvel superheroes imbued them with a heroic ideal. Filmmakers have infused screen versions of those characters with aspects of their originators’ worldviews. In Christopher Nolan’s Batman Begins, Bruce Wayne declares, “It’s not who I am underneath, but what I do that defines me.” This statement reflects biblical spirituality and demonstrates a “never-ending battle” that exists within the hearts and souls of humanity. Thomas Parham, Ph.D., is a professor and executive director of screenwriting and curricular development in the Department of Cinematic Arts. 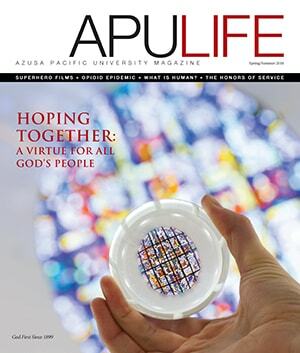 Originally published in the Summer '18 issue of APU Life. Download the PDF or view all issues.